His bands are called "New Bag”, “Sound Fountain" or "Bunter Hund", and the same thing applies to all of them: nomen est omen. He chooses his co-musicians exclusively according to the pleasure principle, does not know any prejudices not only in this respect, but also plays and has played with Fredy Studer, Urs Leimgruber, Carla Bley, Ray Anderson, Erika Stucky, Marilyn Mazur, Han Bennink, Albert Mangelsdorff, Jamaaladeen Tacuma, Marty Ehrlich and the pipa virtuoso Yang Jing. He detests prohibitions on thinking and pigeonholing, fears nothing and nobody, and hardly hates anything as much as boredom or routine. He regularly jumps back and forth between Jimi Hendrix, Samuel Becket and Chinese folk music in the search for inspiration and seems to expand his artistic portfolio every second. Sometimes the thought of what it might look like in Christy Doran's head comes to mind. Probably untidy, full-packed, rather chaotic, mega-interesting and incredibly fascinating, especially when you discover how much undiscovered and unplayed music is still slumbering in the most absurd formulations. To be honest. who gets the idea to bundle 20 electric guitars, four electric basses and a drumset into an orchestra that has never before existed in this form? 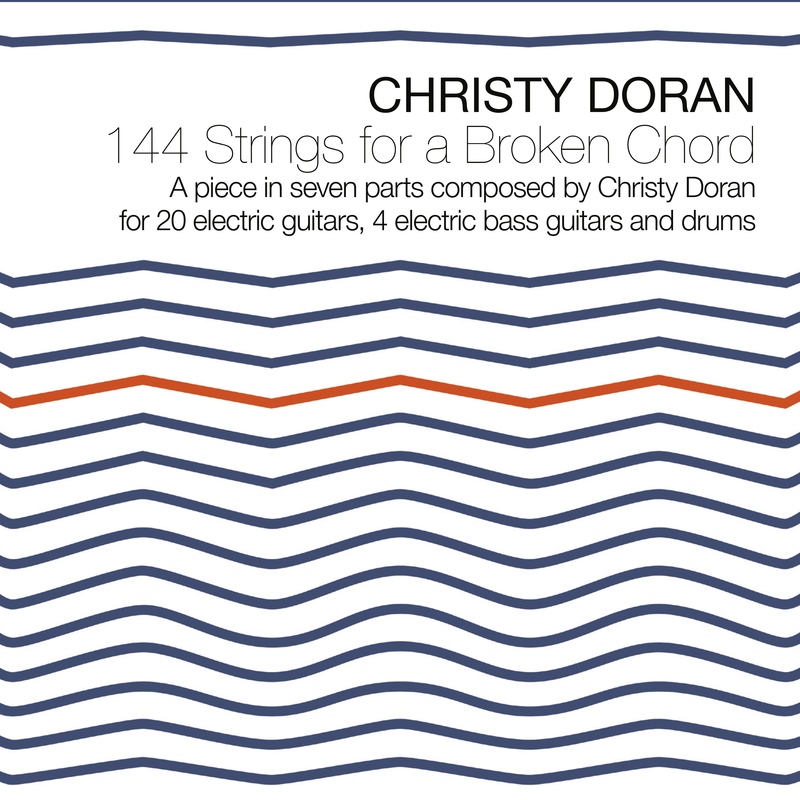 Christy Doran counted them exactly and consequently correctly calls it "144 Strings For A Broken Chord" in view of the tempestuous storm that it creates. In doing this, the jack-of-all-trades on the electric guitar with all its tonal possibilities such as the amps or other electronic devices, his loyal companions over all those eventful decades, creates a highly emotional declaration of love. “Their potential is boundless,” the 68-year-old Swiss musician raved. Not only for him as an instrumentalist, but also as a composer. That's why Doran composed his 144 strings on a corpulent body with seven energetic, bustling, noisy, unpredictable compositions somewhere between rock, contemporary jazz, noise, contemporary classical music, groove and world music. A wild, normally hard to control amalgam that John Voirol had to deal with on the conductor's stand, but which he surprisingly had tightly under control at a concert on September 17, 2016 in Christy's hometown of Lucerne, without robbing the protagonists of their individual freedom. You have to listen to this sometimes brutal elemental force, which can change into a soft hovering in a matter of seconds, a vacuum of reverberating sound fragments. And note: Each of the 20 guitarists and four electric bassists brings his own personal touch to the daring project, creating a special, original sound that resembles an artistic DNA with the help of smaller or larger instruments. At some point, 24 voices overlay and create a strange shimmering, edgy and quite cool stereo effect. An acoustic as well as a visual natural phenomenon. Another new mutation from Christy Doran's genetic laboratory of united sounds. He has always been like that. Always on the lookout for the nonconformists, the unusual, the barbs in the flesh of the prosperous mainstream. Born in Greystone, Ireland, and raised in Lucerne, Switzerland, the guitar dervish cannot do otherwise. For "144 Strings For A Broken Chord", he again assimilates particular types of memories, fantasies, information, experiences, moods, influences, grooves and colors. The fact that Doran initiates a resounding festival for the strings in general and the guitar in particular is one of the many facets of this unusual, restless musician. "A spectacular undertaking, and never a dull moment."